The controversies surrounding the trial of the leader of Indigenous People of Biafra, Mazi Nnamdi Kanu and presided over by Justice John Tsoho may have seen an abrupt end, as the allegedly biased Judge have been forced to hands off from presiding over the trial. Mazi Nnamdi Kanu and two other defendants who are being tried by the Buhari led Nigerian government for alleged treasonable felony, today September 26, 2016, at a court sitting in Abuja, inflammed the already hot sit for Justice Tsoho as they openly asked the Judge to step down from handling the trial, accusing him of incompetent and biased dispensation of justice. Prior to today's court sitting, numerous human right activists and groups have repeatedly called for the resignation of Justice Tsoho from handling Nnamdi Kanu's case, as accusations that he is under state sponsored intimidation, and desperation for personal ambition increasingly becomes indisputable. 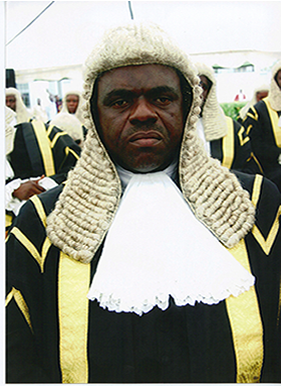 The Defence Counsel to Nnamdi Kanu had already written documented petitions to the Chief Justice of the Federal High Court asking for the replacement of Justice Tsoho in the trial. Other petitions were also directed to the international community, alerting them on the predicament of Mazi Nnamdi and colleagues, whose human rights are being suffocated by state-influenced judicial pronouncements. It should be noted that on in February 2016, Justice Tsoho had refused to grant Nnamdi Kanu bail, based on the presumption that he may jump bail, which was in accordance with President Muhammadu Buhari's speech during his controversial media chat on December 29, 2015. More eyebrows were raised when in a subsequent court hearing early in March, the High court judge revoked his earlier court ruling which was against the secret or masquerade trial of Nnamdi Kanu and his colleagues. However, today's just concluded court proceeding may have just raised hopes of getting justice for Nnamdi Kanu and his colleagues, with the immediate resignation of Justice Tsoho from further handling the case. Today's proceedings started at exactly 10:05am immediately after the arrival of Justice Tsoho and the two Counsels. The court clerk read the case for the day, followed by the introduction of the Counsels. First, the Prosecuting Counsel, Hon S.N Labaran representing the Nigerian Department of State Security, DSS, introduced himself followed by the introduction of Hon. Barrister Chuks Muoma(SAN), representing Mazi Nnamdi Kanu and Hon. Barrister Maxwell Opara representing the two other defendants, Benjamin Madubugwu and David Nwawuisi. An argument ensued between Barrister Chuks Muoma and the prosecuting counsel over the failure of the later to submit an affidavit countering the suit filed by the Defendants on June 26,2016. Barrister Chuks Muoma- "My Lord,I have not been served with any counter affidavit, opposing the application I made on the 26th of June 2016. A motion was filed on the 20th of June and we filed our counter on the 30th of June 2016. My Lord it came as a surprise to me, when the defending counsel told me this morning that, he has not been served with the counter affidavit. I would want one of the prosecuting counsel, to go and check from our records, for confirmation." Judge: It means, you are not aware of the development? "I was very surprised when San Chucks Muoma demanded for the photocopy and I told him he was supposed to have one with him? Surprisingly, he said, he doesn't have any with him,because he was not served according to him. JUDGE: There is a possibility of a disconnect somewhere. You get it, when the court is on vacation, because there could be some disconnection from some of the staff." Chucks Muoma: My Lord,at least I have been vindicated by what you just said, if not it would have seemed I lied. I was the one who demanded for it. My Lord in all my career as an advocate, I have never seen it. My Lord, I am surprised that, the prosecuting counsel is opposing the application of this court not hearing my clients’ case. We don't want this court to hear it anymore and we have the right to do so." Muoma noted. "The fact that the defendant have said, he doesn't want this court to hear this case, justice should be done. The three defendants have indicates they have lost interest and are don't want this court to continue with it, I suggest that this court should hands of the case." He said. The Judge replied and asked: "The second and third defendants are new into this case, why jumping in to say, you want the matter to be transferred to another court?" The judge who feels embarrassed by the move ordered the Defense counsel of the two other defendants to have a sit. Judge: "I am so embarrassed, on the kind of counsels we train, who have no respect? How can the defending counsel ask me to hands off a case, without doing it properly?" Barrister Chucks Muoma: "My Lord, I don't think that this matter should raise any eyebrow. My lord, good judgment should be shown by this honourable court to send this case back to the CJ,so that some other Judge will handle it. If the defendants have lost confidence in this court, then let the court hands off." JUDGE: "You have to talk to your counsel, because they have no right to talk to me mannerlessly." SAN Muoma: "If I were you, I would have asked the CJ to take another judge since there is no confidence." The judge read out his resolution within some minutes after which he announced his resignation from handling the case and promised to transfer the case file back to the Chief Justice of the Federal High Court to assign to another judge. "Since the defense counsel, have demanded that the presiding counsel, should hands off the case, showing bias in the court. This court hands off and forwards the case to the CJ." Justice Tsoho concluded and the session ended. Family Writers reporting live from Federal high court Abuja.